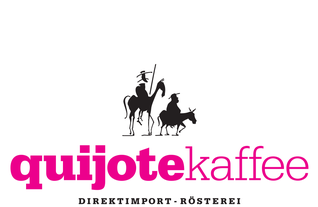 We at Quijote Kaffee have a policy of buying green coffee that is unique in Germany. A real partnership to our parter co-ops is what matters to us. We put the focus on regular visits, joint development and most of all to accept full financial responsibilty for our actions. We are deeply convinced that our policy could stand as a role model for the coffee business and that the consequence of implementing this policy could also be inspiring to others. Therefore and as we’ve got nothing to hide we are permanently working to keep our actions as transparent and clear for outsiders as possible. As a logical result of this we might be one of the most transparent coffee roasters worldwide. We do not only publish our buying contracts and invoices for green coffee and all other financial aspects as a detailed price calculation and our own wages but also the technical details. These are for example the roasting profiles of each and every single one of our coffees. We are fed up with anachronistical things like „roasting secrets“. We are providing our experiences and make our know how available in the most democratical way. For the first time we are now publishing a transparency report that contains all relevant data. This is an absolute novelty within the German speciality coffee business. 1. We maintain close personal, professional and long-term partnerships with all our partner co-ops. 2. We visit every one of our partner co-ops at least once and up to three times a year. 5. The buying prices, quantities and qualities will be jointly negotiated and contracted before the crop. This gives certainty to the financial planning for us and the co-ops. 6. We are prefinancing the crop with at least 60% oft he contracted amount. It is a lot easier to get access to bank credits in Europe than it is in coffee producing countries. The 40% outstaying payment will be paid CAD. 7. All of our green coffees have an organic certification. Only the two Robusta co-ops in Ecuador don‘t have a certification as they are too small for it. Quijote Kaffee is a Hamburg based workers collective of ten persons. Steffi, Giselle, Katharina, pingo, Julio, Schwan, Chris, Max, Elias and Andi make all their decisions equally and in consensus. There is no boss and there are no employees in our concept. All colleagues are on the same wages, regardless of their membership time, experience and qualification, their position or their contributed capital. In our opinion decision-making by consensus leads to far cleverer decisions compared to those made by a boss on his own. These decisions will be supported by everyone, increase the individual motivation and moreover lead to a higher efficiency and job satisfaction. Everybody can bring in his or her ideas and push the collective forward. Beside the coffee import and the coffee roasting we are also running the „Kaffeeschule Hamburg“. This is a school where we provide courses on sensory properties, barista skills and coffee roasting. We also offer private trainings and consulting. In order to pretend falling prey to the beast named greed we have limited our wages to the maximum of the Hamburg average wage. This helps us to protect our ideals and utopia from ourselves and the voracity often to be found in successful companies. Every member of our collective at least visits one of our partner co-ops once a year and is also encouraged to regularly take part in high level professional development. All our green coffee imports strictly follow the above listed criterias. In order to ensure this high standard we personally visit all our eight partner co-ops in Honduras, Ecuador, Peru, Guatemala and India at least once and up to three times a year. We maintain long-term relationships to all of these co-ops. It is very important to us, like usual in fair trade, to collaborate with peasant farming structures only. This form of organisation supports the more democratic and equal allocation of knowledge and earnings compared to the large scale landownerships dominating in some countries. Right from the beginning of the crop we jointly discuss with the farmers at which terms and conditions we are going to buy the coffee. This results in a high certainty to the financial planing for all stakeholders. We are prefinancing 60 % of the crop at this point of time as it very difficult for peasant farmers in coffee producing countries to get access to bank credits. These negotiations not only contain prices, quantities and qualities but also processing relevant topics such as moisture of the green coffee, varieties, processing methods, drying times and sometimes micro regions or lots. This is a relevant difference to the purchase of available coffee after the crop. We take the financial risk as we obligate ourselves to definately purchase the produced coffees under the agreed terms and conditions. As a result we are getting planning reliabilty and very often outstanding qualities. The following list contains information about the latest paid prices, the length of our partnershio with the particular co-ops and the time of our last visit. A scan of every purchase contract and all invoices can be found on our website under the tranparency column. Price FOB $ / lib. We at Quijote put our trust in long-termed partnerships and close cooperations. The length of the partnership is a very good indicator regarding the sustainability of our model. It is our aim to jointly create a social and qualitative development. We are not chasing after the most rated coffees in the world and then move on to the next. We want to be a reliable partner on the difficult way to high quality coffee produced on a regular basis. Most of our coffee imports are blends of high quality coffees supplied by different members of the co-ops- In case of microlots we always purchase these from the co-op. We are trying hard to personally visit all our producers at least once a year. These visits serve a deeper personal relationship, mutual trust and the exchange of demands and opinions. This is substantial for understanding and cooperation while working on the future development of the coffees. Over the year we constantly keep in contact via mail, skype and telephone. Coffee is always paid for in US$. The quantity referring to the price is one libra (around 454 g) green coffee. The prices we pay are always „free on board“. This means for coffee that is packed in grain pro bags and ready for export shipment in the destination harbour oft he origin country. Not the complete amount of the price being paid goes to the farmers. Several costs including processing, administration, transports, packacking etc. have to be subtracted first. These costs totally sum up to 30 to 35 % of our prices. We are actually working on an even more detailed calculation in order to publish the prices finally paid to the farmers. On our side we have to add costs for communication, travelling, seafreight, insurance, customs clearing, container trucking and discharging. 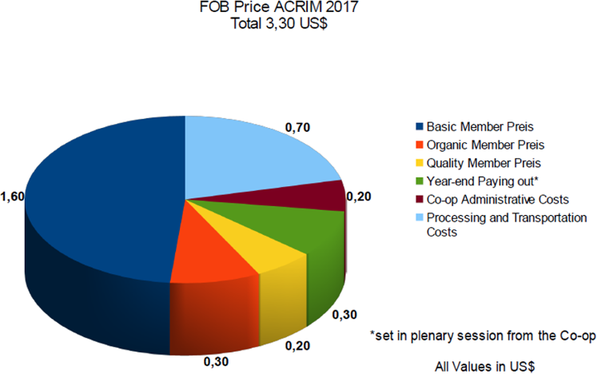 In the following sheet we will show at the exemple of ACRIM how the FOB-price of 3,30 US$ per lib. is made up and how much every member receives. We will fine-tune these data in the next weeks and publish them for more co-ops. Here we are publishing a very extended calculation using the excample of one of our coffees. It is based on our actual costs an the expected quantity of 73.000 kg roasted coffee to be sold in 2018. This public calculation will be continuously updated. This is a very important addition in order to show transparently why the producers in the origin countries still get a „small“ piece of the cake only. Our wages actually add up to 3.900 € per person and month. Five colleagues are on full-time (40 hours a week), four at 80%, and one at 30 %. We pay an extra amount of 300,- € for children or relatives in need of care. In times of demand like travelling, holidays or illness we have temporary employees. Their service is limited to a maximum 5% of our working time and they get paid the same wages as us. The calculation also includes revenues coming in from other business units such as our „Kaffeeschule Hamburg“ or the sales of green coffee to other roasters. 50 % of our roasted coffee sales go out to business customers like bars, restaurants and companies. These customers usually get an average discount of 15%. This is reasonable as it is a lot easier and quicker to pack, send and bill one single carton with 28 kg coffee than 20 cartons with 1,5 kg coffee each. The other 50% are distributed via our webshop to private customers. We don’t supply resellers except the bars who are allowed to sell the coffee they are serving to their guests. Paying the highest price to our partner co-ops and keeping the selling price to our customers as low as possible is similarly important to us. The so called „Effective Growers Share“ (EGS) shows that we are succeding on this. The EGS is the share of the selling price that is finally paid to the producers. Quijote is worldwide market-leading among the transparent roasters who publish these data at all. For more information on this please see the very informative website of Transparent Trade Coffee. We do not only assume but are really hopeful that the purchase prices for green coffee will increase in the future so the producers will get more out of their work. We actually pay our producers a guaranteed minimum purchase price of 2,60 US$ per libra Robusta and 2,87 US§ per libra Arabica. These prices are adjusted to the inflation rate and rise yearly. Any feedback and ideas for improvement are always more than welcome. We are nerved by the still predominant secretiveness within the branch of speciality coffee. From our point of view phrases just as the „roasting secret“ or „based on the longtime experience of our master roaster“ should not be used anymore. We can clearly point out that 90% of the coffee quality refers to the farmers‘ work of cultivation, harvesting, processing and warehousing. We as roasters can only interpret the coffee. And if we – as very many within our business sector – don’t have a clue at all we are likely to roast it to death. We are convinced that a sustainable development within our branch of business is depending on the comprehensive exchange and sharing of experiences and know-how. We need to teach and learn from each other. For this very reason of transparency we go further than any other roasters known to us in Germany and publish all our roasting profiles. The respective table forms can be found on our website. Other roasters get the opportunity to take a look at our „interpretation“ of our coffees and can compare their roastings to ours.